This genus of around 650 species in the Bromeliaceae family are becoming a big hit with plant lovers. Tillandsias, commonly referred to as air plants, are an evergreen, perennial flowering plant, native to the Americas. They are a popular choice for an indoor plant, and are also extremely water-wise. Care is minimal, they don’t get bugs, and if they dry out you can easily revive them with some water. Why are they called air plants? The genus of Tillandsia are epiphytic, meaning they grow upon other plants (such as the branches of a tree). An epiphyte derives its moisture and nutrients from the air, rain and other organic matter building up on and around the plant. 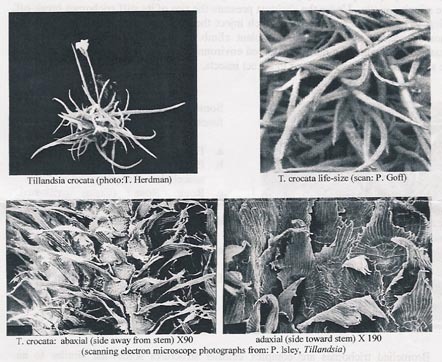 Air plants differ from parasites because they don’t negatively affect the host. Thus Tillandsias have been labelled as air plants, because they lack the need for soil. Also, their roots are not used to draw moisture or nutrients in, but rather as anchorage or support. It is common for the plant to root on itself, and one can find amazing clumps of multiple air plants growing on each other. It’s the leaves of the air plant that are responsible for obtaining the necessary moisture and nutrients from the rain, dew, dust and decaying matter. This is another characteristic that differs an air plant from a normal plant. The leaves do this using trichomes, which are fine outgrowths on the leaves that are similar to hair. The plant propagates both through seeds and producing offsets called ‘pups’. These pups are babies forming off the mother plant after it has flowered. A single plant can produce several offsets, that can be separated when two-thirds the size of the mother plant. After which these pups will grow large and form their own clumps. Most Tillandsias are hardy enough to be grown indoors and can thrive under the right conditions. It is important to ensure the plant receives adequate natural light. A perfect spot would be in well-lit room or by a window. The air plant will require additional watering inside, as it is unable to draw the same amount of moisture as outside, nor get the exposure to the morning dew. Air plants are fast becoming one of the most popular plants to use as decorations. From wedding decor to a table centerpiece, these colorful, modern looking plants are both affordable and durable. Florists are using them in wreaths, arrangements and living alternatives to cut flowers.